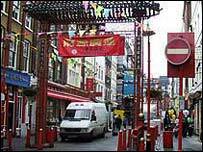 A gunman who shot and killed a man in a bar in London's Chinatown, is being hunted by police. The 37-year-old victim was drinking with two friends in the brb Bar on Gerrard Street in Soho just after 1700 BST on Tuesday. A man walked up to him and shot him at least twice before running out. The victim was taken to a central London hospital but died three hours later. The area, which is popular with tourists, has been sealed off by police so forensic examinations can be carried out. The suspect is believed to be Chinese, aged between 20 and 23 and about 5 ft 10 in. He had distinctive long hair with highlights, possibly dyed red at the back and his hair fell over his face at the front. He was wearing a distinctive red shirt. Detective Chief Inspector Mark Pepper, leading the investigation, said: "We are appealing for any witnesses to this shooting to get in touch with us as soon as they can. "Gerrard Street would have been very busy at this time of day and we want to hear from anyone who thinks they saw anything that might be relevant." Mr Pepper said several witnesses had already come forward but the motive for the killing was still unclear. Police say they believe they have identified the dead man but his next of kin have not been informed.